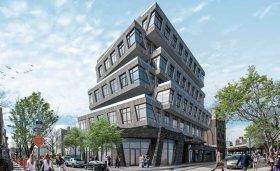 Brooklyn real estate developers RYBAK and BK have laid out their collaborative plan for a new luxury condominium in East Williamsburg at 88 Withers Street. The building, when officially approved, will be called Element88 and will capture the neighborhood’s creative and eclectic residents. As CityRealty learned, renderings show a sculpted pile of floors, offset from one another. In addition to its 33 new residences, the building will also provide workspaces in its cellar that can be used for home offices, workshops, wine cellars or art studios.